Yamaha fans who were clamouring for the Japanese manufacturer to launch a YZF-R3 based naked in India have much to rejoice. The MT-03 street-bike will be launching in India sometime in the coming year. In the exterior department, the MT-03 gets a beefier fuel tank, with a sculpted look that’s in tune with its intended usage as a street bike. The chassis is exposed and the tail-lamp shrinks to fit into the classic mould. The track-inspired riding position should get revised in the MT-o3, so expect an altered peg-to-handlebar ratio. Speaking of the latter, the clip-ons from the faired sibling understandably get the boot here, with a street friendly, wide, single-piece unit taking its place. All this should result into an slightly upright riding posture which should do well for spending hours on the streets. The Yamaha MT-03 shares its heart with the fully-faired sibling. The familiar, twin cylinder, 321ccengine from the R3 jumps across and makes itself right at home in the naked environment. Complete with liquid cooling paraphernalia, the engine is expected to be offered in the same state of tune, making 40 bhp and 29.6 Nm torque. Said to weigh about 165 kilogrammes which should put smack bang in ideal street-bike territory, the MT-03 will come with disc brakes all-round. 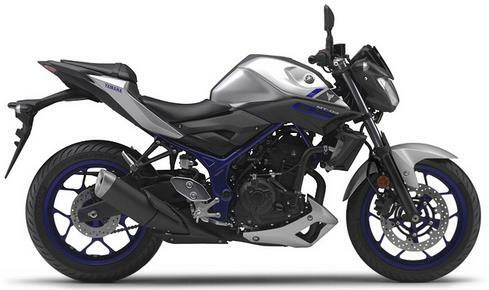 Word has it that Yamaha should be assembling the MT-03 locally, here at its facility in India, therefore pricing is expected to be competitive. But wait, don’t pit this against the usual suspect that is the KTM Duke 390. A single cylinder and a twin, do not make for an even match, cubic capacity being similar and all. So, the MT-03 will actually go up against the likes of theKawasaki Z250 and the Benelli TNT 300, both proper twin-cylinder machines. Interesting battle brewing up then, one that we’d love to see being fought and settled in the streets!